Metal Bracelet or Leather Strap? 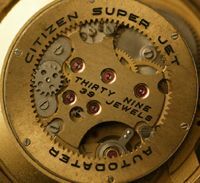 The majority of Citizen’s watches were originally sold with steel bracelets, sometimes gold plated, sometimes black. Although some bracelets are very nice, and it’s good to have an original one fitted, I confess to a preference for leather straps. I find them more comfortable and in my opinion they can look better than steel. Living in the UK with its cool climate, leather is also ok for the prevailing conditions. 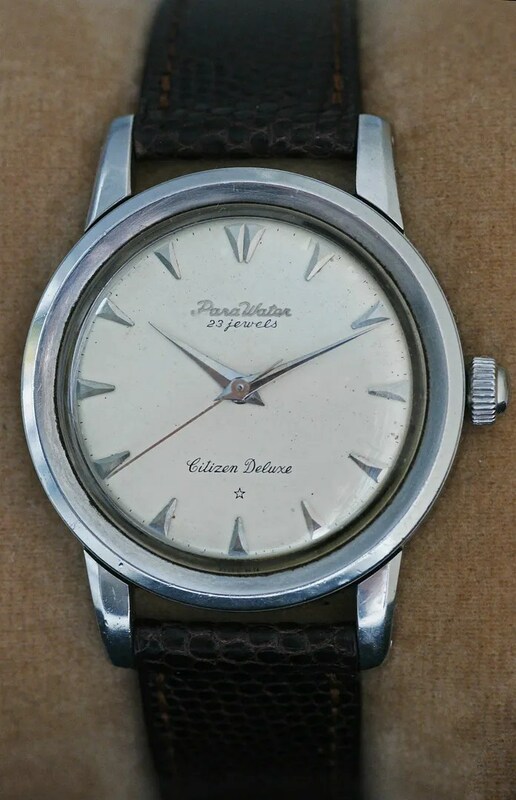 Although ‘Parawater’ clearly refers to keeping liquids out of the watch, a UK Citizen sales person’s hand book I have – from around 1968 – emphasises that the basic proofing (i.e. to 10 meters / 1 atmosphere) is good to keep dust out, thus better preserving the quality of the oils. After a comment from Bogdan I realised that I hadn’t had the back off this one – so just did that, and pleased to see a nice low number on the movement. 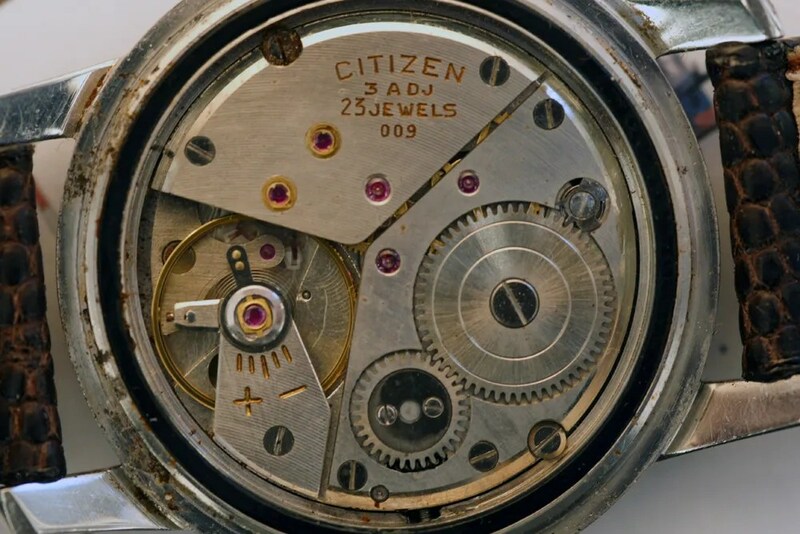 I don’t know how Citizen determined the number though…. 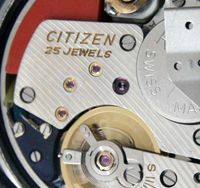 This entry was posted in Vintage Watches and tagged Citizen Deluxe, Citizen Parawater, Vintage Citizen Watches. Bookmark the permalink. 10 Responses to Metal Bracelet or Leather Strap? Not bad, not bad at all! If possible a movement shot? Nice! Thanks for sharing! 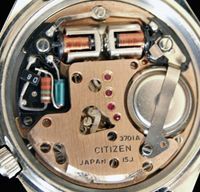 I love that feeling when openning a watch and not knowing what you’re going to find inside. The best is finding a nice movement, like this! 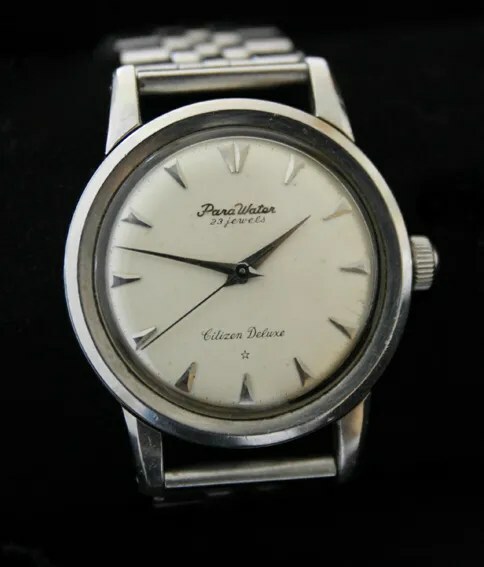 Very interesting, I have a 21 jewel newsmaster in NOS with original metal bracelet,s/s, watch is gold tone,a very stunning watch. Pete. Hi Pete, thanks for visiting my blog – interesting that you have a NOS example, many of the Newmasters I see have had a hard life! Hi Stephen, Would love to send you a pic of this very nice citizen of mine. Pete. Just like what I have decided for my cosmotron, you won’t go wrong with leather. I have waited this kind of thread… Well, everyone have their own taste, but i think, that there should be an original bracelet/strap. 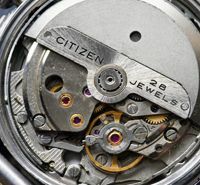 It´s just so difficult to find out, which one was that original… And if you get that information, then you have to find it from somewhere :D.
Hi Marko, I don’t know when those expanding type bracelets were first made. I agree that if you can get an original bracelet then you should! Or leather, but they are hard to find of course. I have two leather straps that I am confident are original although one is too fragile to wear, and one part leather/part metal where the leather has just about disintegrated! The leather ones are on a Hisonic from the early 1970s, and the fragile one is on a Jet ‘Rookie’ from 1962. 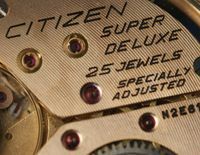 The Deluxe Parawater might have been Citizen’s first to come on a steel bracelet (in 1959) – makes sense for a waterproof model which could be worn when swimming.